Cheers To The MEW Year ! Me & Myself gonna celebrate 2013 with YOU ! 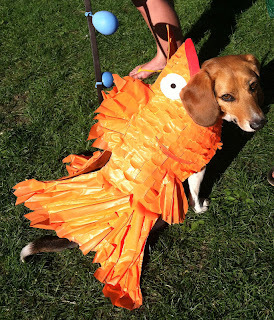 Just shout "Hello sistah, hi ya bruddah & I luvs you too with dat feather". 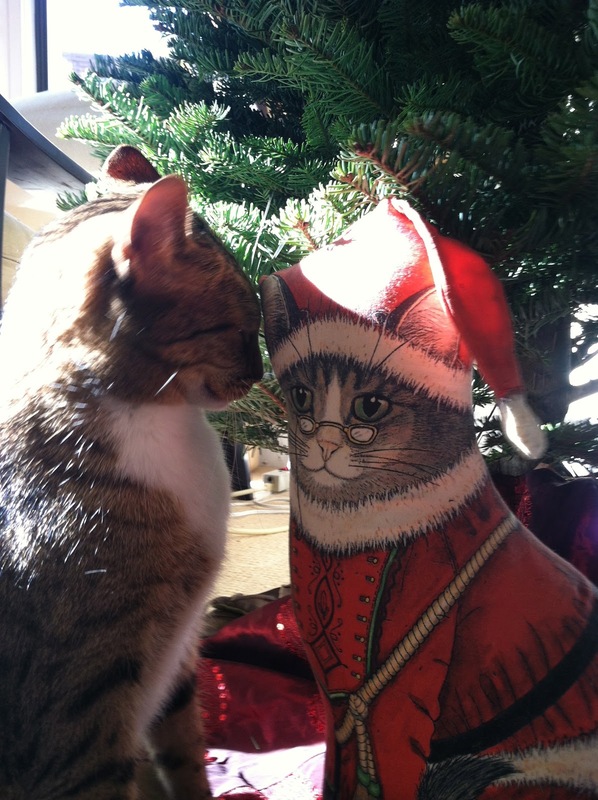 And I gives youza the Happy Mew Years Kiss that's a real EyeTailYun WOW! Whatever we duz on Mew Years Eve, itza shure Ok with me. 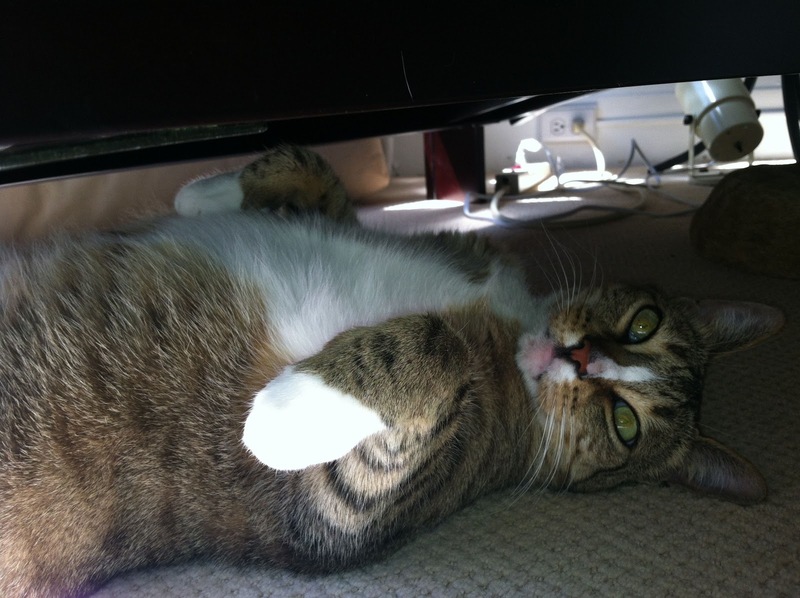 Me and Myself hopes 2013 is YOUR Catzowey year. and make it a nonCATastrophic one too! 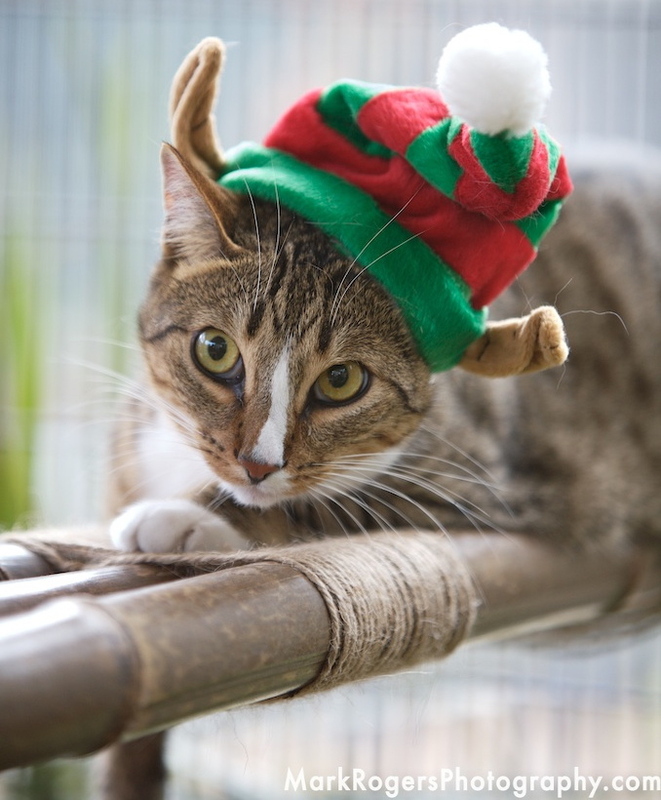 Wanting to wish you a merry purrfecto Christmas Eve & Buon Natale Day. While Me & Myself are chillaxing, listening to dat Messiah by Signore Handle. Yep uh huh, wishing for Spaghetti & Meatballs served to me by a crew of little well trained mice. I treasure your furiendship & wishes you the mostest meowvalous New Year. Catzowey! 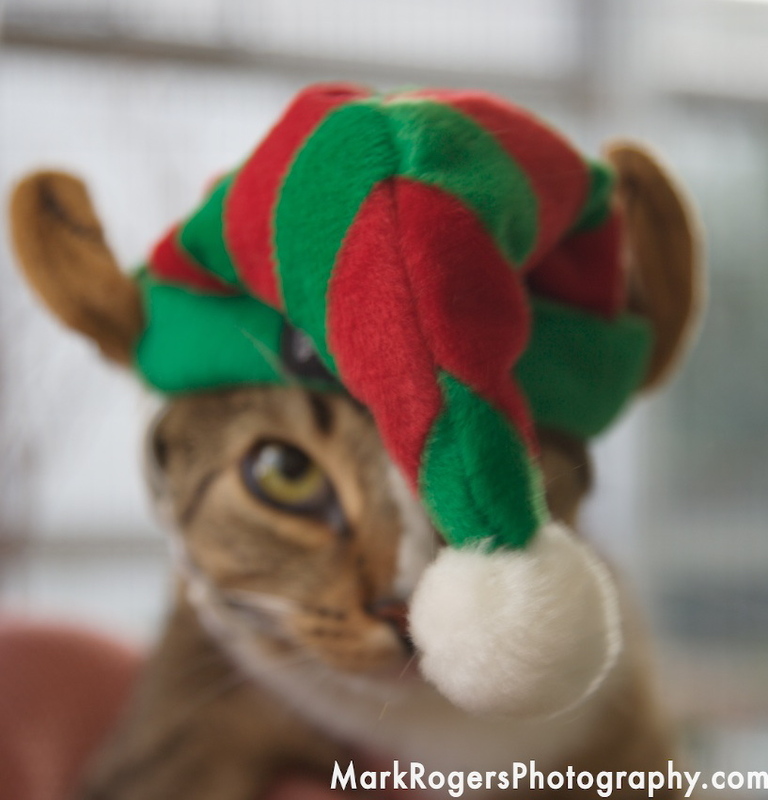 Me & Myself signed up to help Santy Paws spread good cheer. So I grew a beard just like his Ho Ho Ho beard, yep uh huh on my chinny chin chin. 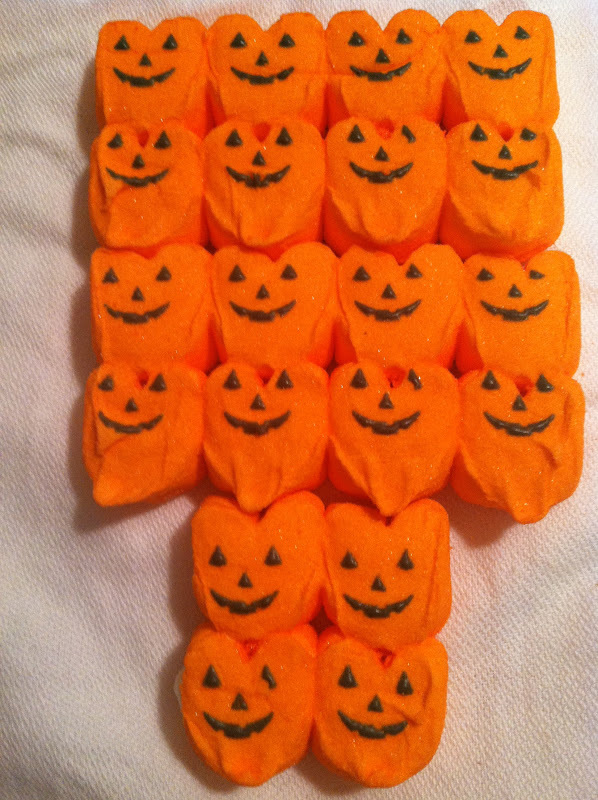 Does it makes you grin? What the Dickens izza going on here? 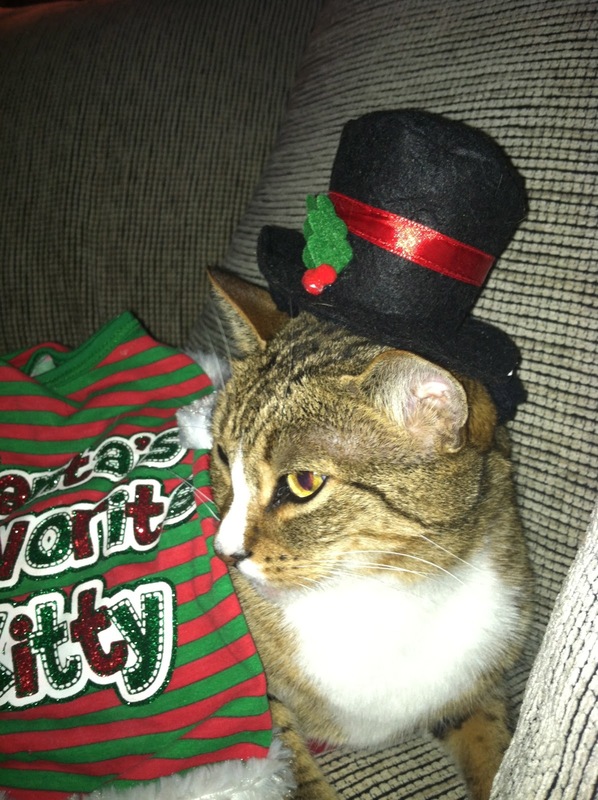 My Signore Scrooge hat is spreading Holly Dazed cheer and better that hat then dressing up as a red-nosed reindeer! 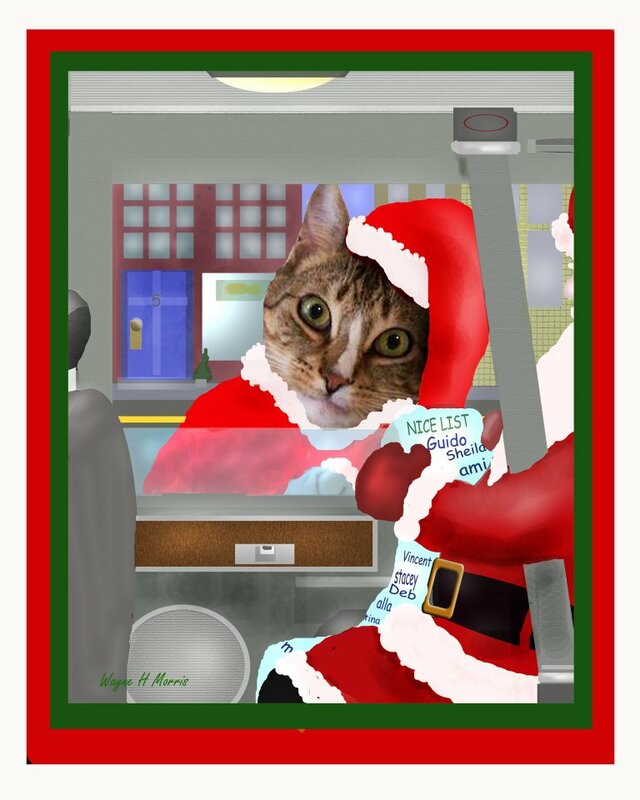 Bah Humbugzaloni - itza no EyeTailYun baloney, that Me & Myself are in the Holly Dazed mode cuz I signed up for Santy Paws on the job helper this year. Hoping good Salami and Sardines are filling my Buon Natale stocking. Yep uh huh - itza fur shure my Buon Natale stocking izza real authenticat EyeTailYun - like Me & Myself. 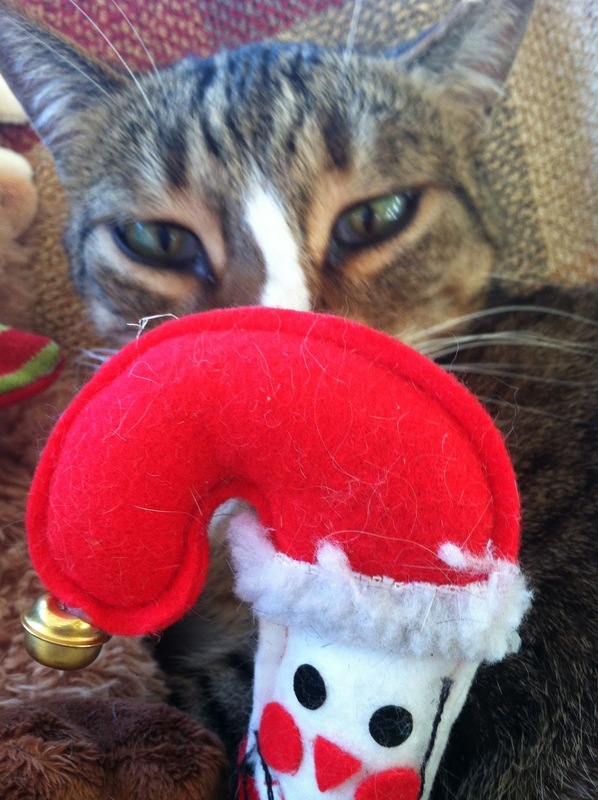 Hmmmzatini, how's my Pizza Meowgarita gonna fits in my Cwismus stocking? Making my list, checking it twice! Cuz I knows youza never naughty but always nice. Letza deck out the desk with a twig of holly, might make someone feel an inky dinky bit jolly. Weeza can jingle and mingle and share abundacat Holly Dazed ho ho ho, BUT if youza down South in Australia youza not seeing Cwismus snow! Nope youza not. 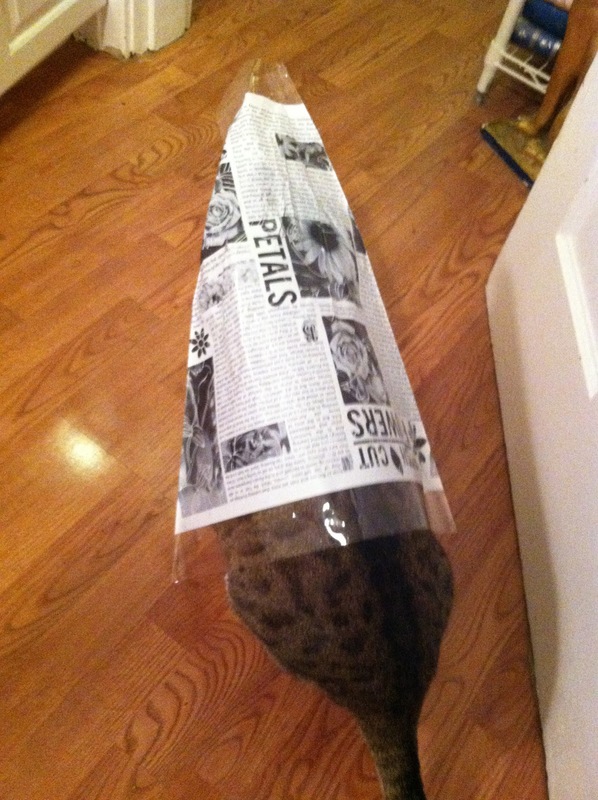 Youza can give the envirocatically correct gift in a snap - a Holly Dazed HUG doesn't need to be wrapped. Catzowey! The Signora Santy Paws has dropped by to share some Holly Dazed cheer with Me & Myself. I'ma checking her twice and sheeza seems authenticatically nice. Whispered the sweet every-things into her ear for her to hear cuz sheeza got a direct connection to Santy Paws himself. 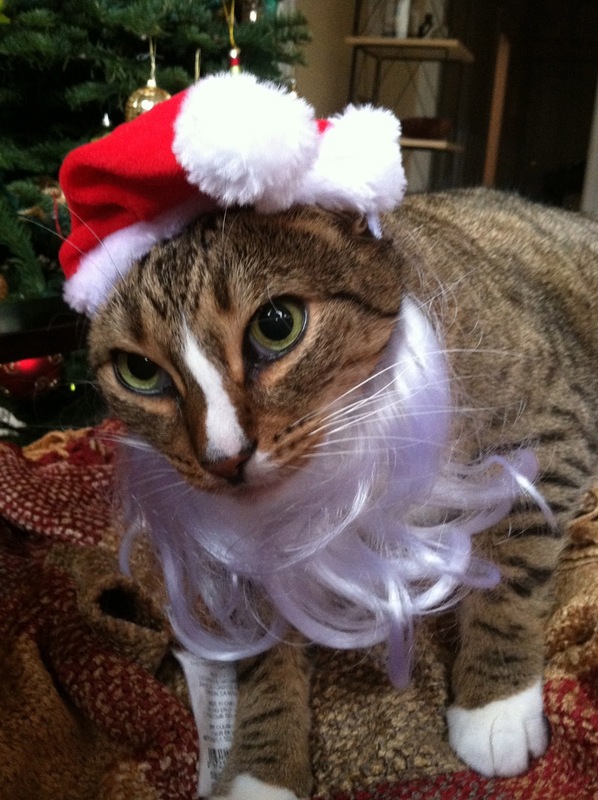 I wanted to get more into the Holly Dazed mode so I borrowed Signora Santy Paws' hat so I could mingle and jingle pawsatively and go Ho Ho Ha Ha Ho, here we go. Then Signora Santy Paws suggested a walk through the Winter wonders land forest which was suffering from da drought and didn't get too giganticat sized this year. Finally, Signora Santy Paws and Me & Myself all took a days long Catnap cuz weeza been bizzi kitties all day today and purrhaps tomorrow too. 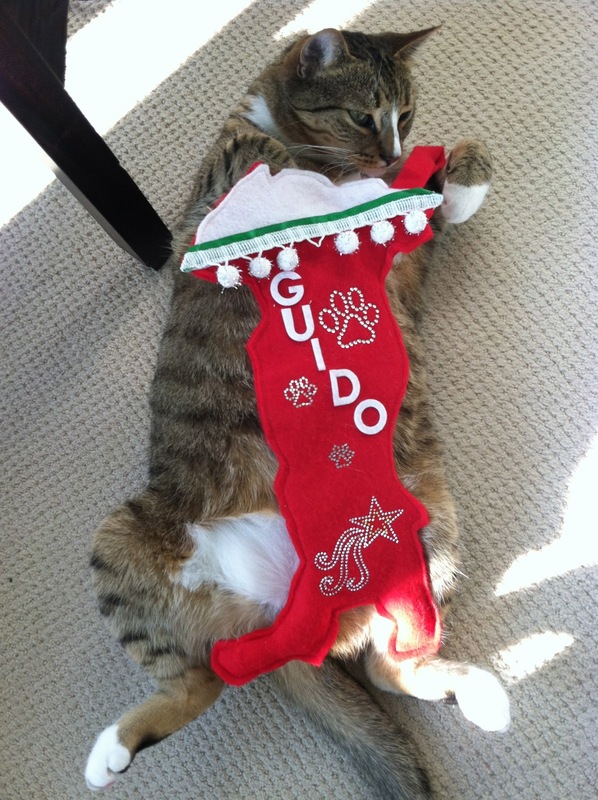 Wrapping uppa the day the Guido way and meowvalous to say "The End". Well jingle my EyeTailYun jewels - oopsatini I means ring my swell bells cuz I hears music in the stores playing "Let It Snow, Let It Snow." SO let's go figure out what we duzn't know. Tis the season to have a reason to ask yurself after a whole giganticat year, "why did I tangle uppa those Cwismus lights last year in a hurry and furry?" Well, I don't know! 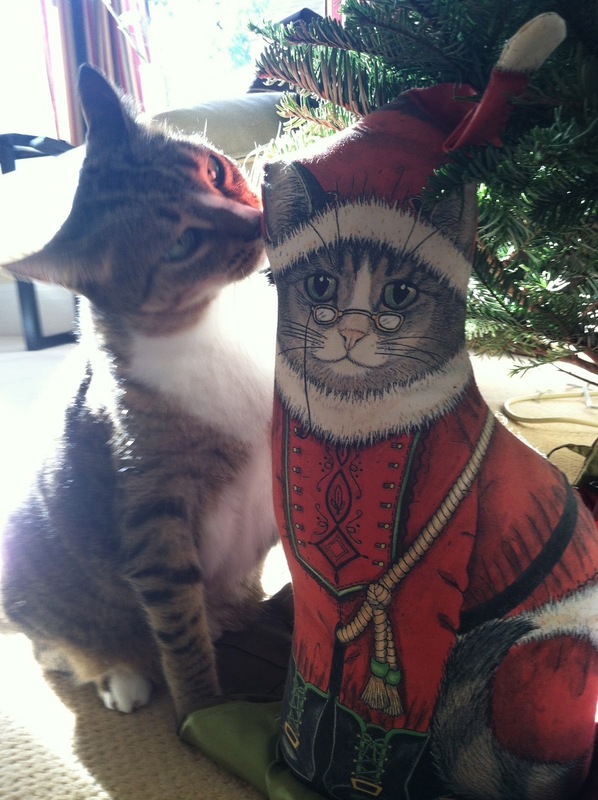 But I do know itza the purrfecto time to chime in and speak uppa with where youza wants to put dat 1st ornament! Yep uh huh, itza fur shure dat inspectacatting da tree in a doggone good pawzishun is right and the branches gotta be tight or they're not right for .... Branch Walking! Bamaztini! No chillaxing at this time of the Year cuz once you knows yur Tree branches can hold ya, then you gotta hang all the ornamentos! 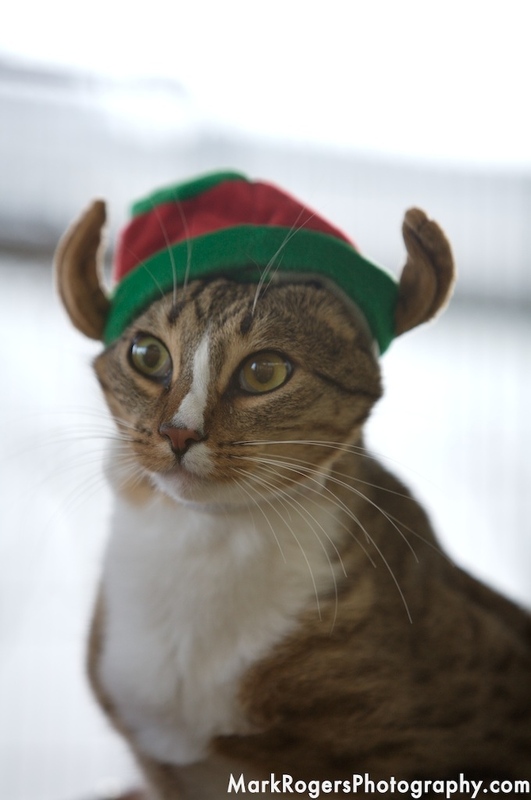 Holy Cannoli youza gonna be ready for an EyeTailYun HollyDaze cocktail or purrhaps a double shot of Catzowey espresso! Remember, it's the start of a Season to have a a Reason ... so go fur it! NOW I gotta figures out how to hang my Cwismus Stocking. Wishing you a nonCATastrophic week & we'll cat chat soon! 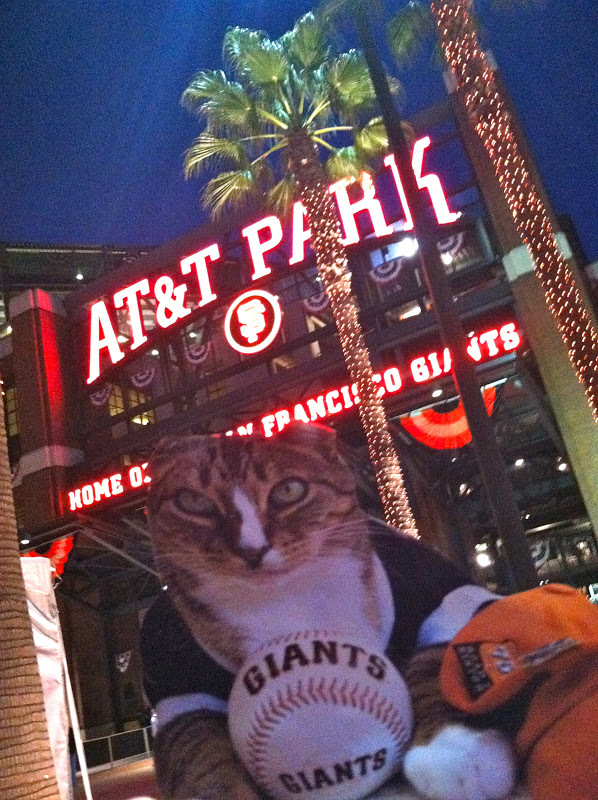 Here in San Franfuncisco, I live at Sea Level which levels my purrspective to see good. But sometimes youza gotta change that direction you're looking at life at - yep uh huh I recommends it fur shure. Cuz life is absoluticatically about what purrspective you see, at Sea Level or another level. Even the Mailbox can have a different purrspective and view of youza too - yep uh huh, depending on how it is standing on the Street or how itza leaning like the Leaning Tower of Pisa. And a purrfecto pawzishun is the name of the game if you wants that Catzowey view from an "under the stuff" supurrbo purrspective. Of course, it's a different handle and really different purrspective when Me & Myself sees me on a handbag! And I don't mean sitting or lounging on a handbag but really ON that handbag. Holy Cannoli what was someone thinking? Catzowey! Do YOU see what I see at Sea Level? 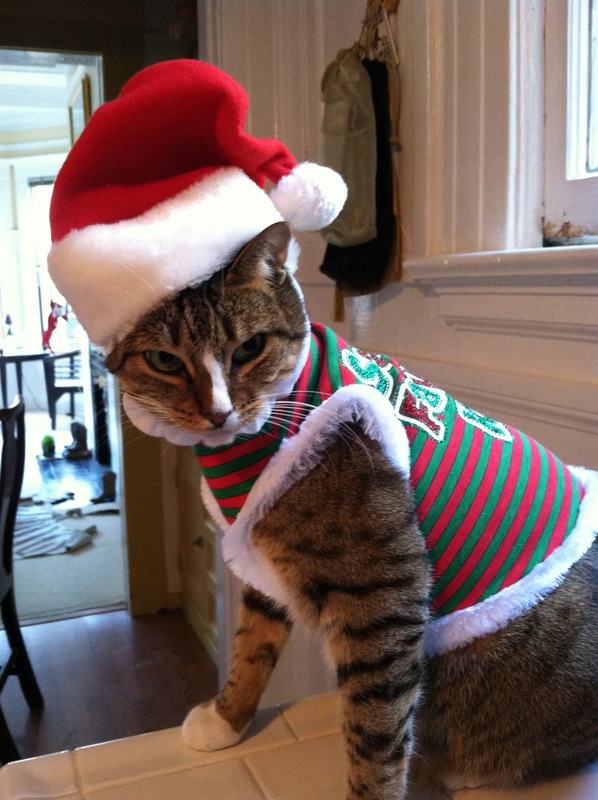 Looks like the Holly Daze are coming to town, according to my pawsative cat eyes purrspective. But it's still November and time to remember that I wishes you a nonCATastrophic week. 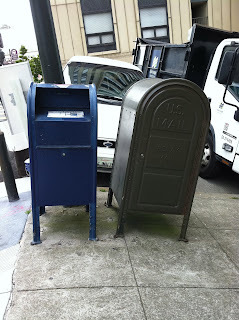 From San Franfuncisco, Me & My EyeTailYun life loving self sends good greetings to you this week. Catzowey! 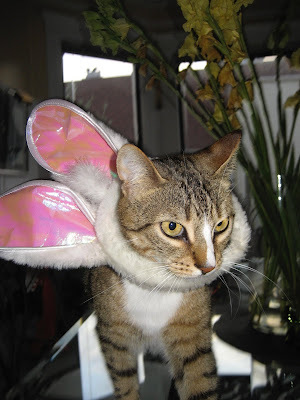 It's the purrfecto week to be giving abundacat thanks if youza lives in the USA cuz it's Thanksgiving Week. 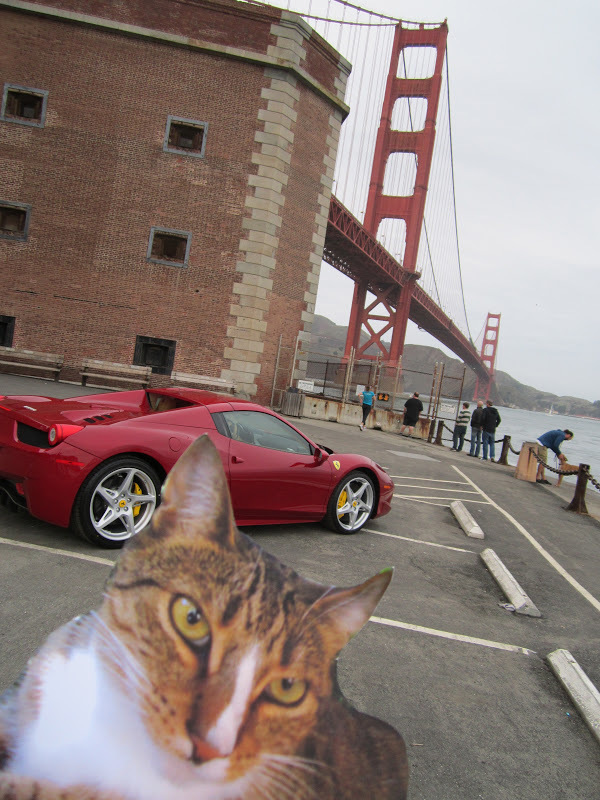 Drove my Furrari to the Golden Gate Bridge to give the thanks in the parking lot, with a lot of view for you. It's funtastic to gloat about my goat furiends - and I gives the thanks for them - yep uh huh it's for shure. Doggone big thanks to my pooch pals whooza guard me in the swimming pool when I'm a float without a boat in my Guido Speedo. 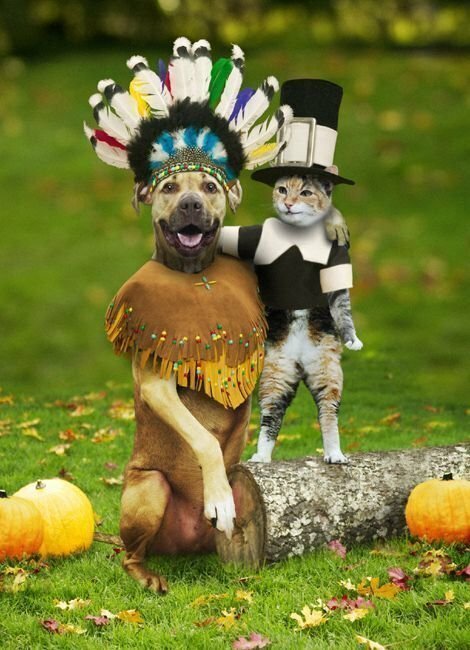 Meowvalous to give thanks to the FurKneeChure deeziners whooza makes life and living comfortable. But I think does it has to be PINK? Whether youza feathered or furry, dontcha worry cuz I gives abundacat thanks to youza for always being my Catzowey furiend! Catzowey! Abundacatically it's for shure, you will find Me & Myself looking UP UP UPPA to find a miracle cuz miracles do happen. Yep uh huh they do. Itza definitely a miracle that this EyeTailYun organicat RedPepper is giganticat sized! Another miracle is Me & Myself doing the Cirque Du Soileil balancing act. Ta da meowvalous! 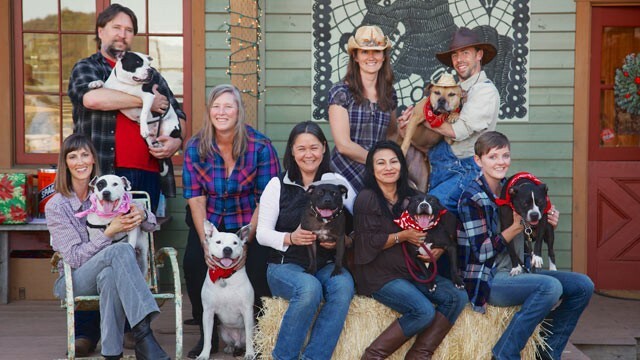 And, my mostest favorito miracle this week is seeing 7 former Michael Vick fighting pooches that have been saved, like rescued to furever loving adoring homes and theyza all reunited! This photo was taken by MY favorito photographer Mark Rogers. And you can read all about it RIGHT here so grab a catpuccino and enjoy a miracle article. Doesn't this foto makes you smile? Itza miracle, and itza reason to never ever give up on thinking doggone meowvalous miracles can't happen - cuz they do! Catzowey! Time IS on my side for shure. Me & Myself are digging down deep to be shure the Watch didn't fall into this vase! Cuz we gotta be shure we got it on the new non Daylight Savings Time so we knows when to take the abundacatnaps exactly right on time and not an hour later. Pssst, whooza invented this changing the time?? The unanswered answer izza HERE! No matter how ya look at it, time IS on your side so be shure you don't let the 9 lives pass you uppa not matter what time zone youza on or in. 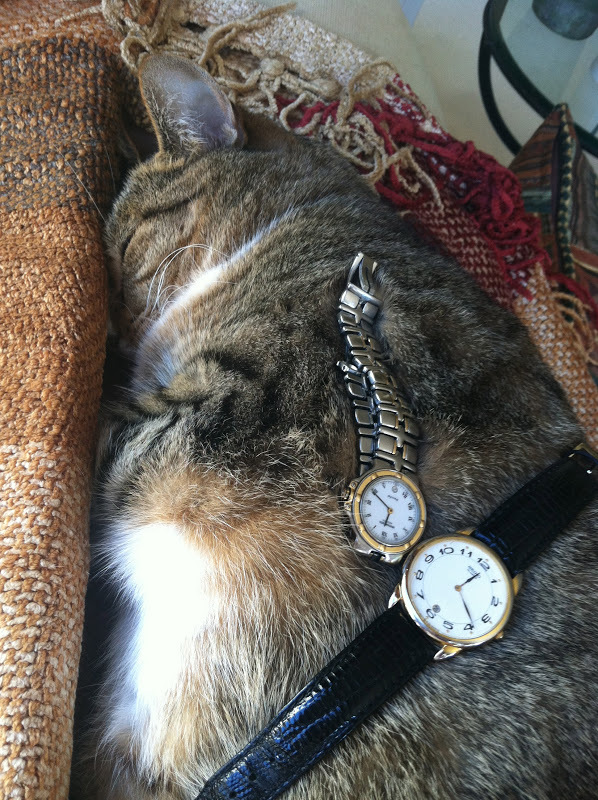 Meowvalous to see my furiends have me coming on time to my job at the right time! And yep, uh huh, I wanna tell you, that it's pawtastic to be right on time all of the time with your favorito Cheesie Grater accompanying you. Kind of comfurting. 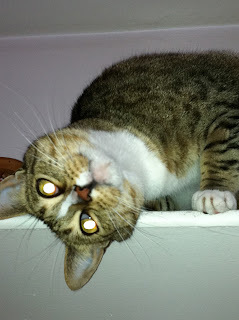 Wishing you a PAWSatively nonCATastrohpic week and be shure yur clocks are set correctacatically! Orange & Black Is Big This Week ! 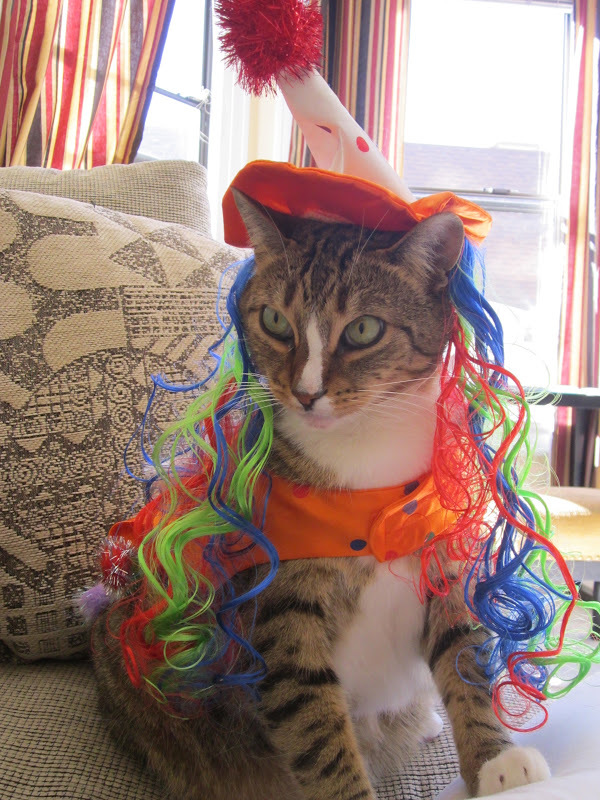 I'm not clowning around when I tell you it's the purrfecto week of the whole giant year to dress up and be someone youza always wanted to be, or even someone youza duzn't wanna be. 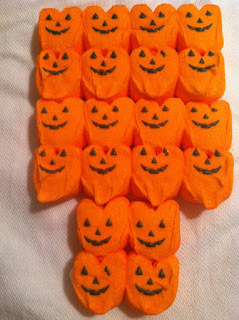 Hey, after all itza Halloween week and itza the week for wearing the Orange & Black. It's not fishy at all that someone loves ORANGE in a doggone good way. Orange & Black OR Black & Orange - duzn't matter how youza looks at it. Itza all purrfecto colors for this week. 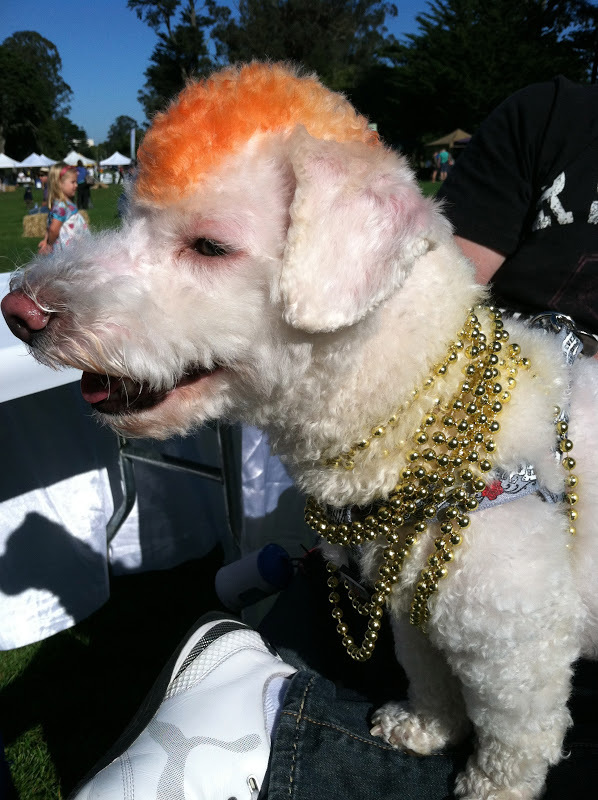 My doggone cool neighbor pooch is wearing his ORANGE and feeling purrky and smirky cuz he's wearing the colors too. Stylish & EyeTailYun deeziner Orange & Black izza acceptible for any event this week - yep uh huh it's for shure. 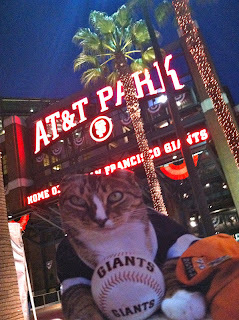 Me & Myself luvs wearing the Orange & Black colors to cheer on my WORLD SERIES CHAMPION San Franfuncisco Giants! Everybody in San Franfuncisco izza wearing our Team colors and weeza all smiling too! 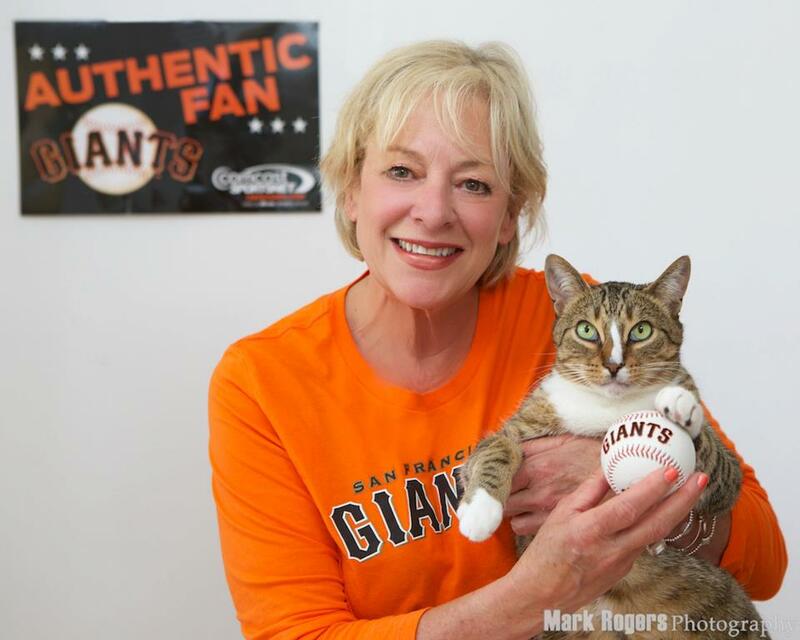 Concats to my San Franfuncisco Giants for winning the 110th World Series (how many years is dat in a meowster's life?) 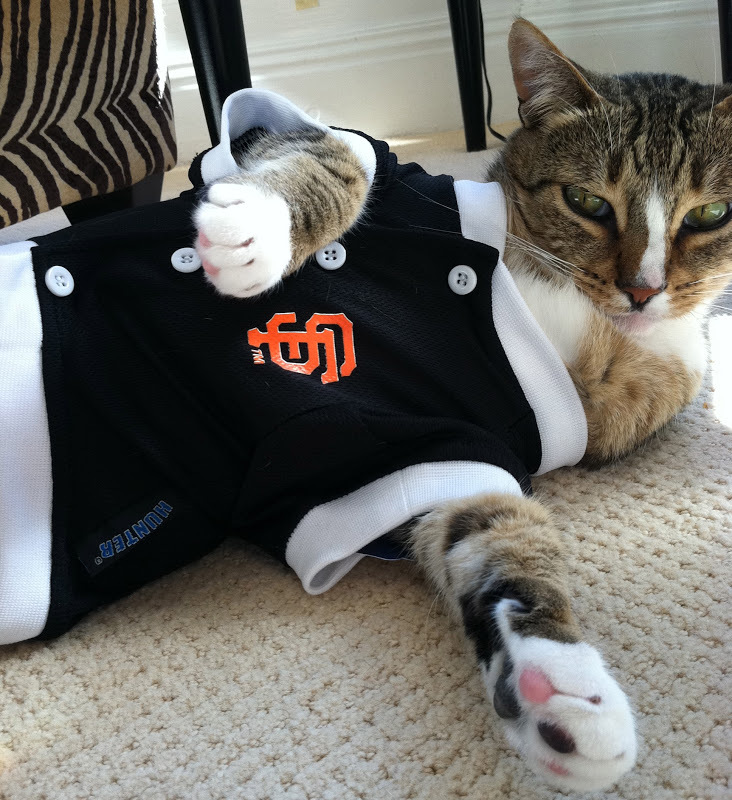 Gonna be purrroudly wearing my Orange & Black even when I takes abundacatnaps. 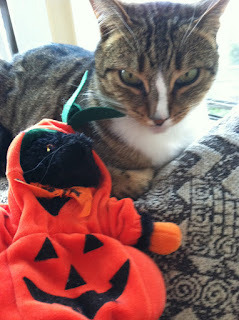 My Staff and Me & Myself wish you a GIANT sized nonCATastrophic week and Happy Meowloween! Ever since Me & Myself wazza smitten kitten sized, I've been playing ball in a Giant way! And nothing more purrrfecto than playing ball with a good furiend, yep uh huh, cuz furiends are the spices of life like good organicatnip and sweet EyeTailYun basil! Pssst, good furiends are almost as good as sharing a Pizza Meowgarita with extra cheese please! 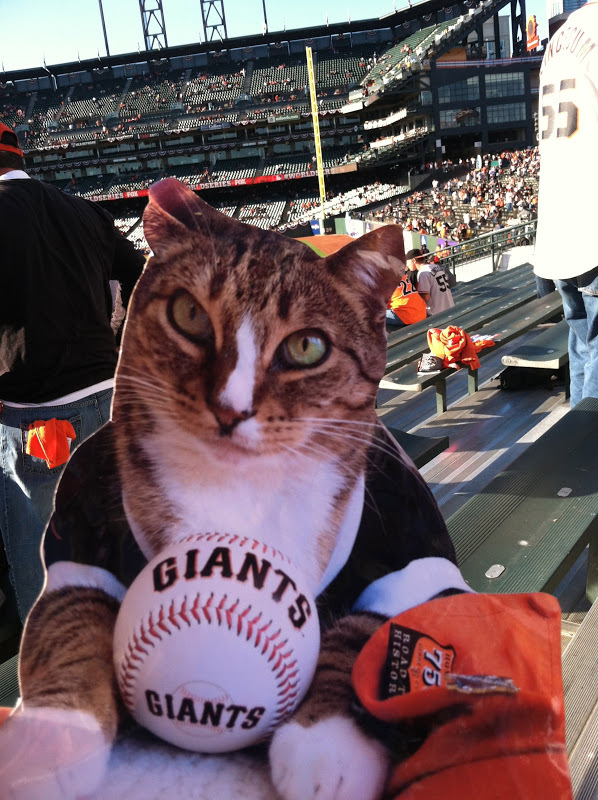 Holding on to yur furiends like I holds on to my favorito Giant baseball izza what makes life speshule. 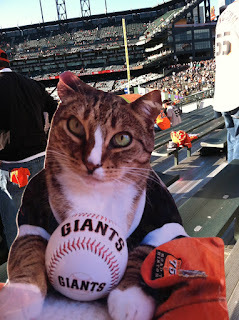 It's meowvalous to Take Me Out To The Ballgame (sneak that song in at the 7th Inning Stretch) and share fun meowments with my man cat pals, doing what we boyz do - smiling in a GIANT way! Didja know that song is older than all of us cuz it was composed in 1908! Me & Myself are fashionably correct having Giant fun in the sun or in my famoso FOG too will do! The Staff and Me & Myself wish you a nonCATastrophic & Giant great week!